This past Tuesday night, I had just gotten to Stu’s studio for the life drawing session when Rainy called. She was really upset because she was sure she hadn’t gotten the summer internship she had applied for. She was on her class field trip and some of her classmates had heard that they got the internship. Because Rainy hadn’t heard anything, she was sure that her news would be bad. This left her struggling with what the next steps in her college education would entail. She has the credits to graduate with a BA, but she needs the BS in order to work in wildlife research. We talked about her back-up plan of doing another Wildlands Study, this time in Ecuador. We also talked about what her steps would be after the summer program was complete. I am always wishing that there was something I could do to make everything perfect for Rainy, I just don’t have the magic to make this happen. We talked for quite a while, I think she felt better than when she called. I was subdued for most of the evening drawing session. I missed the first few gesture drawings, but did get to participate in the 2, 5-minute gestures. I did work in pastels again. I brought blending stumps and workable fixative with me as my intention was to take my time, work areas more slowly, and to fix as I went along. My process evolved into starting the basic figure with a quick pencil sketch, just to lay out the figure on the page. To achieve correct proportions, I used my pencil as a sighting tool. This worked out quite well. Then I gradually worked in the pastels, smudging and blending gently with the stump. I did’t take the time to spray with the workable fixative as I worked, but just sprayed the drawing at the end of the 20 minute pose. This was because I didn’t want my movement to disrupt the other people that were drawing. My second drawing of the night focused on the model’s torso. I can’t remember the model’s name. I drew on the back of the paper my first drawing was on (something I don’t usually do) because I was not pleased with the first drawing. This one is titled “Model with Red Hair”, and is 13″ x 20″. I like drawing a 3/4 view of the face, it is challenging but more interesting than a profile. I struggled a bit with her hair because I didn’t have the right colors of pastels to capture the reddish tone as I would have liked. Because this drawing was so much more successful than the first drawing, I was able to settle down into the process of drawing. 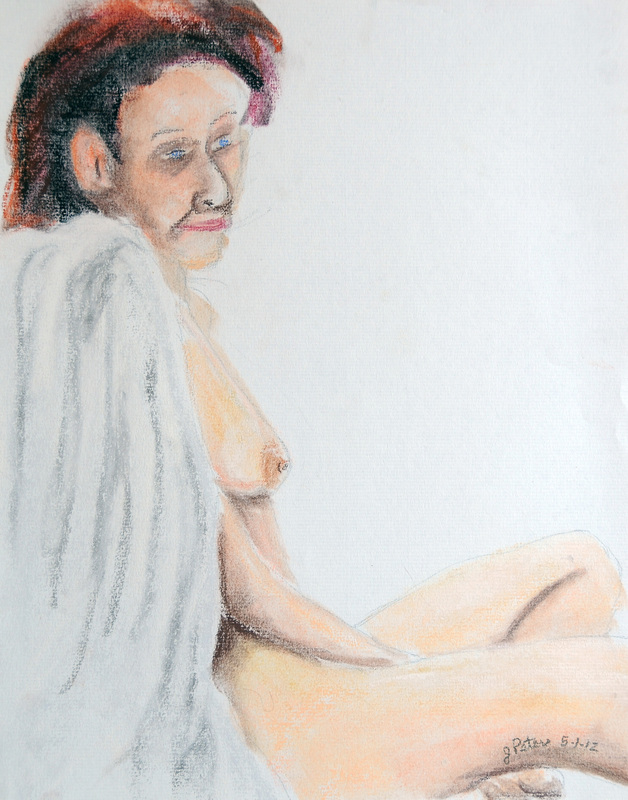 This next drawing is titled “Relaxing with Robe”, it is on 11″ x 14″ neutral toned Mi-Teintes paper. I didn’t have the best view of the model, but managed to shift my easel over just a little so that I could see just a bit of her breast and more of her face. Even though it doesn’t look much like the model, I did like the composition. This third drawing is titled “Resting in Blue”, it is 11″ x 14″ on blue-toned Mi-Teintes paper. I really liked this pose as it challenged me to correctly interpret the foreshortened figure. Because I was working on blue paper, I chose to work in a variety of blue pastels. Once I was home, I added in the pastel beneath her midsection and her head as the drawing seemed to need that extra information. My final drawing of the night was my favorite one. 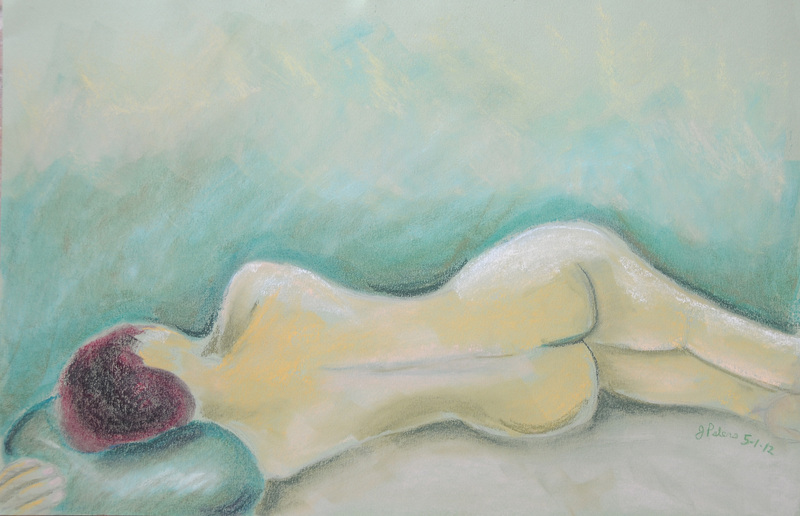 It is titled “Model with Green Pillow”, it is 13″ x 20″, soft pastel on green-toned Mi-Teintes paper. I like the overall composition with the figure placed in the lower third of the picture plane. The green of the paper is a difficult one to work with, so I decided to not use a lot of greens in the figure, but to instead work with more yellow tones. I did incorporate the greens into her pillow and the sheet she is laying on. Once I got home, I thought the upper portion of the paper looked too empty, so I came in and blended some additional greens and yellows into the negative space. 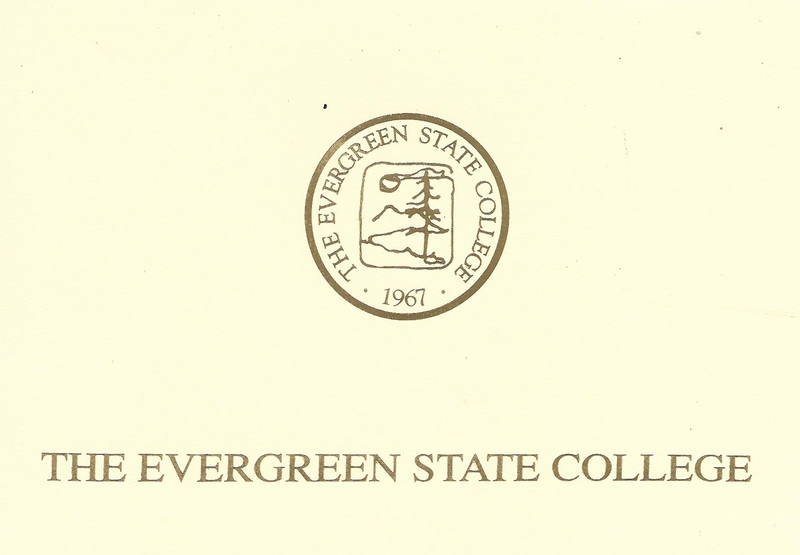 It is hard for me to believe that in just over one month, my daughter, Rainy, will be graduating from Evergreen State College. 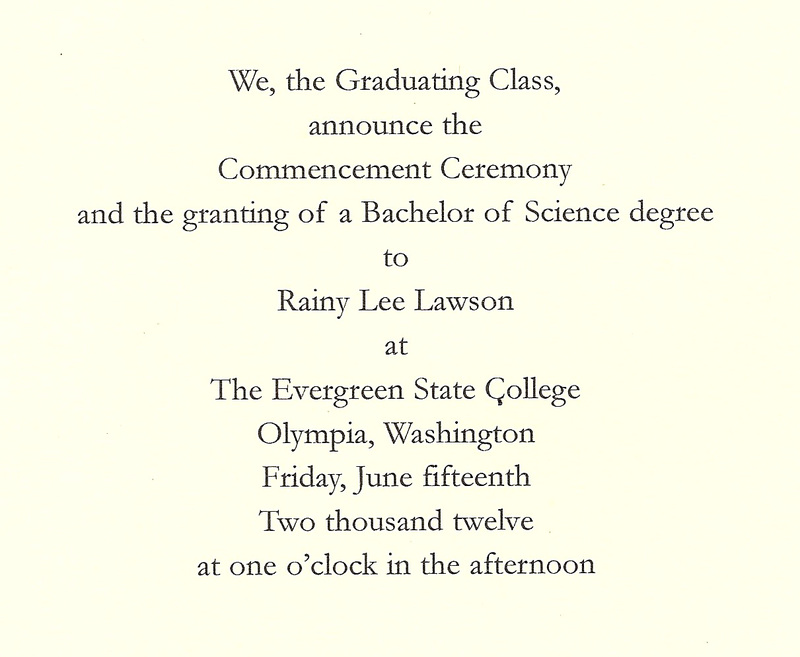 Yesterday I received my order for Rainy’s graduation announcements. I feel so many different emotions….joy for the young woman Rainy has become, amazement at her wealth of knowledge, happiness that she is about to graduate, awe over where she is in her life right now, excitement for what her future might bring. That is just the beginning. I didn’t know that receiving the box of announcements and addressing the envelopes would bring out in me so many different feelings and emotions. I wish I could capture the way I feel on canvas. Perhaps I should try.